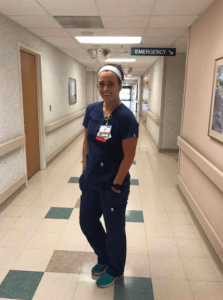 Meet Savanah Case, a hard working, last semester nursing student at MidAmerica Nazarene University in Olathe, Kansas. She shares her nursing school experience and advice for any nursing student finishing their journey. What does a typical day look like for you as a final semester nursing student? One word, busy! Take a peek at Savanah’s typical weekly schedule below. Describe your experience with clinicals. Clinicals are a time where you finally get to put the things you have learned into practice! You are going to learn so much from how to interact with patients to how to provide care for patients. As a student, it is important to recognize you are there to learn. If you aren’t busy with your nurse, ask other nurses if they need help. The more you see and do, you will not only learn more, but feel more comfortable doing things. What advice would you give a nursing student preparing for his or her first day of clinicals? The night before clinical I set out everything I am supposed to take with me the next day: scrubs, stethoscope, scissors, penlight, pens, clinical paperwork, lunch and snacks. Also, wear comfortable shoes that are broke in, 12 hours is a long time to be on your feet, especially when you typically sit in class half the day. Once you are there, be ready to learn! You will hear new medications and terms that you have heard of but can’t remember everything about them. I always take an extra piece of paper with me in my pocket and if I come across something I didn’t know about or can’t remember, I write it down and review it when I return home. Graduation is just around the corner. What advice have you received that has helped you prepare to head into your career as a nurse? Being a nurse, the thought of caring for patients by yourself is exciting, yet somewhat scary! Some of the best advice I have personally received is to do what I am passionate about and chase my dreams. I know this advice isn’t shocking because for most of us, we have been told this our entire lives. However, if you are like me, I never really understood this until I was about to enter the “adult world”. Another thing I haven’t necessarily been given advice on but have learned along the way is, asking questions and taking initiative for your learning is something you should take from the classroom into your career. Looking for more nursing school advice? We’ve got you covered! Check out Part One: What End-of-Program Nursing Students Wish They Had Known at the Admissions Process and Part Two: What End-of-Program Nursing Students Wish They Had Known when Starting Nursing School.